Some nitrogen tanks outside my office. What are these for? Oddly enough, I know the answer. They're for pressurizing phone conduits. I did some consulting work a couple years back in Santa Cruz for System Studies, the largest company in this business. System Studies supplies mechanisms that monitor the gas pressure in telephone conduits. Then, if there's a pressure drop, they can even estimate where in the line it occurred. Another side-effect is the nitrogen helps keep other things like water and oxygen out. 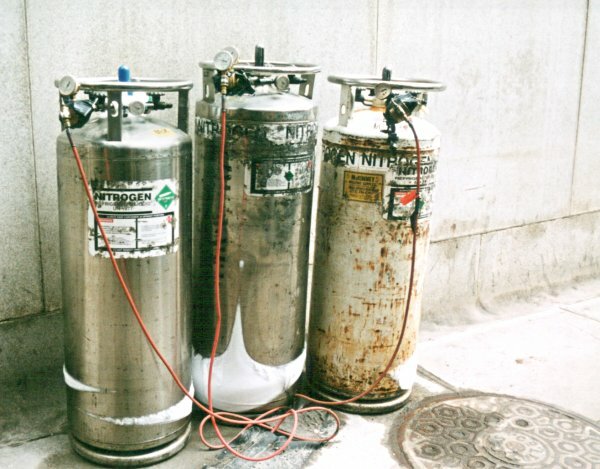 Obviously the nitrogen tanks don't always just sit out on the sidewalk, this is just for repair work. Usually the gas is pumped in at the central office. Weird how those little connections are always occurring in our lives. Update 5/7/05: I love the internets. These guys in Houston are using my pictures as a reference.